M. Tapié, Devenir de Fontana, Turin 1961 (illustrated in colour). E. Crispolti, Lucio Fontana, vol. I, Brussels 1974, no. 61 0 40 (illustrated p. 76). E. Crispolti, Fontana, catalogo generale, vol. II, Brussels 1974, no. 61 0 40 (illustrated p. 110). E. Crispolti, Fontana, catalogo generale, vol. I, Milan 1986, no. 61 0 40 (illustrated p. 369). Venice, Palazzo Grassi, Centro Internazionalle dell Arti e del Costume, Arte e contemplazione, July-October 1961. New York, Martha Jackson Gallery, Lucio Fontana: Ten Paintings of Venice, November-December 1961, no. 3 (illustrated). Minneapolis, Walker Art Center, Lucio Fontana: The Spatial Concept of Art, January-February 1966, no. 40. This exhibition later travelled to Austin, University of Texas Art Museum, February-March 1966. Humblebaek, Louisiana Museum, Fontana, January-February 1967, no. 35 (illustrated in colour). Amsterdam, Stedelijk Museum, Lucio Fontana, Concetti spaziali, March-May 1967, no. 36 (illustrated). This exhibition later travelled to Eindhoven, Stedelijk van Abbemuseum, May-June 1967. Stockholm, Moderna Museet, Fontana: Idéer om rymden, August-October 1967, no. 35 (illustrated). Hanover, Kestner-Gesellschaft, Lucio Fontana, January-February 1968, no. 35 (illustrated in colour). Brussels, Palais des Beaux-Arts, Lucio Fontana, September-November 1972, no. 55 (illustrated p. 76). Concetto Spaziale - All'alba Venezia era tutta d'argento is one of a highly celebrated series of ten paintings by Fontana that are known as the Venezie. Executed in Venice in 1961, while Fontana was staying in the city to oversee an installation of his earlier slashed canvases for the Biennale, the Venezie are widely recognised as being among Fontana's most important artistic achievements. In many ways, the Venezie form the culmination of Fontana's spatial experiments of the 1950s. In addition, though visually very different from one another, every painting in the series comprises the same dimensions and in a topological way, takes as its subject some aspect of the great floating city in which it was made. On completion, the ten Venezie were exhibited together for the first time in the Palazzo Grassi in 1961 at a prestigious exhibition entitled 'Arte e contemplazione' ('Art and Contemplation'). Of all the Venezie, Concetto Spaziale - All'alba Venezia era tutta d'argento is one of the most peaceful and meditative examples. Evocative of the calm gentle lapping waters of the lagoon and high horizon lines of this spectacular city, it takes a more classical format than many of the other more baroque examples from the series. As such, it was perhaps the most suitable work from the series to be included in an exhibition devoted to calm contemplation.The poetic sounding title of this work means "at dawn Venice was all in silver" and in its linguistic rhythm and construction refers to the classic endecasillibo style of Italian verse which, as its name suggests, consists of lines of verse comprising eleven syllables. When spoken in colloquial Venetian, "All'alba Venez(ia er)a tut(ta (d')arg)ento" is compressed to the eleven syllables of this classical style of verse which characterizes many of the greatest works of Italian literature. 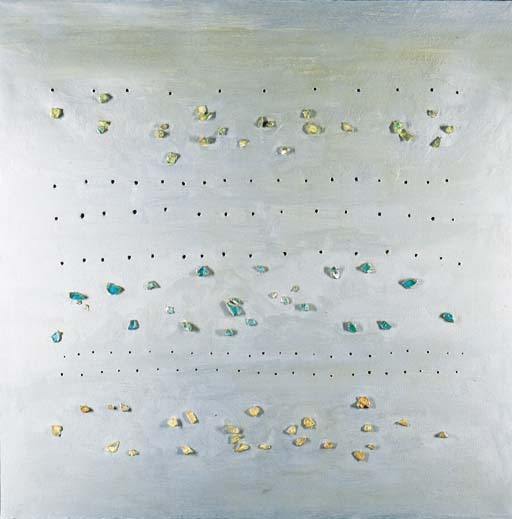 With its eleven irregular horizontal lines made from Fontana's bucchi (punctured holes) and assorted rough pieces of Murano glass, this work is an eloquent conceit on this poetic theme. Its series of horizontal lines filling the silvery spatial void of the canvas with a rhythmical and alternating progression of luminescence, texture and depth visually echo lines of poetry on a page. As if to reiterate this allusion and the sense of the painting being a visual poem in the endecasillibo format, the first line of bucchi in the painting, also comprises eleven syllables. With its silvery reflective surface, the lilting rhythm of these horizontal lines clearly also emulate the gentle ripple on the surface of the lagoon waters surrounding Venice. The ethereal character of Venice, the thin line that exists between the dense watery air of the city and the shimmering luminescence of its canals and lagoons, was something that Fontana evoked in many of the Venezie series. Concetto Spaziale - All'alba Venezia era tutta d'argento captures this unique atmosphere through a spatial play of luminescent material (Murano glass) and void (bucchi) that conjures a strong sense of surface and of floating. Set against a shimmering silver background this peaceful painting conveys a sense of the scale of the vast open spaces that surround the city and which at dawn make it glitter like a jewel on the horizon line between the sea and the sky.